Painting walls is essentially not a very complicated operation. There is not much experience required for this although of course, it is useful to know certain golden rules of painting, without which we can end up with stains on the wall. Today, we will deal with the most popular mistakes made not only by people who paint for the first time – mistakes happen also in seasoned professional painters. It is worth knowing what we should pay attention to by painting ourselves or by making sure that a professional who will take considerable money for his work. The paint should be applied evenly– if we paint improperly on the painted surface, there will be visible traces of the roller. It is necessary to paint subsequent fragments so that they combine them wet. We do not stop painting until the entire wall is painted. In addition, we make sure that the straps overlap evenly, and the last roller stroke on each layer ends in the same movement (usually from top to bottom). Too much dilution of paint – it is not a good way to save money, especially with bright colors that hide the painted surface less well. Too much diluted paint will be very poorly covered and an additional layer may be needed. And this will raise costs. 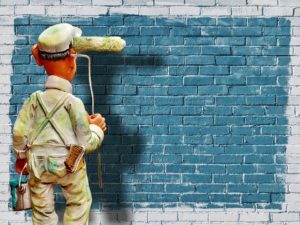 Painting a wall that is not completely dry – it usually does not have a problem with renovation, sometimes it can be so when finishing a freshly-built house. The paint will not stick to damp places, air bubbles may appear in this place. The same applies to the thorough cleaning of the walls before painting, the wall can not be greasy or dusty – in this case also the paint may not stick – and in addition, there will be streaks. Walls and ceilings should be painted at the temperature specified by the paint manufacturer. This is usually from 41 to 86 degrees Fahrenheit. Therefore, it is best to plan your painting in the spring or autumn when there is no risk of a lower or especially higher temperature inside the room. It is also good to take care of a good ventilation of the painted room. For a hard pressing of the roller – the thinner paint will splatter, and thicker will cause the edges of the roller to squeeze on the wall. The roller, especially solidly soaked with paint, should be carried out gently – with sensitivity. Applying dry patches – correcting defects when the wall has completely dried up (usually only two hours) – is not the happiest idea. Walls of a roller or brush will be visible on such a wall. The corrections should be applied immediately after painting the wall. It should also be remembered that the paint tape should be broken when the paint is still wet – when we break it dry – it can go away with fragments of paint.